Eventing Live in the Sunshine - Barocca D'alva 2015. VioVet Supported Rider Catriona Kerruish updates us on her adventures eventing in the sunshine - Barocca D'alva 2015! Well, we made it to Portugal and what an amazing trip it was!!! We set off early Friday morning for our 4 day drive to Portugal. Things didn't quite go to plan on day one, but needless to say with some awesome map reading from super groom Lizzy Norton and few calls made to the super parents we made it to Le Mans for our first stop. Horses, people and little Leo had all travelled well. The next day we drove to an old favourite and very popular stable stop at Belin Beliet; the next stop was in Spain at Vallodolid. We made the mistake of asking why great danes lived in the field with the falabella ponies....wolves.....was the answer we received!!! Hmmmm! Short night there and the final long drive down to Lisbon and we made it! The sun was shining and we settled the horses and set up camp! After a couple of days the competition started! Shorts and t-shirt I'd like to add!! Buzz was up first and performed a lovely test for a very respectable 55 for the first one of the year. His cross-country didn't quite go to plan but that's horses for you and we ended up walking home. Woody....well Woody was WILD the first week and decided that dressage was an unnecessary part of life and performed circus tricks rather than a one star test! I was mortified!!! However, the next day he did what he does best and stormed clear cross country! I forgave him for everything and we both finished with smiles on our faces!! He trotted up fantastically the next day and jumped a beautiful round for just one down. Sunday night was PARTY night! The organizers put on a great bbq for us all, a bar with varying prices lol and then the traditional bull fighting fun and games which took us late into the night. A few quiet days and we were back to it. Buzz once again pulled out a lovely test for our first time riding the new one star tests and I was very pleased with him. However the competition ended there when he wasn't quite himself. After 3 days working non stop with Lizzel Woody started to settle and scored a very respectable 49 in the dressage...my first time in the 40s and that was still with a few mistakes! 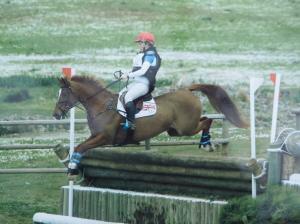 He stormed around the xc with just 3 time faults round a tough long course and I did not stop smiling all day!! He is just incredible out there!! He trotted up beautifully on the last day and jumped brilliantly! This special little horse is one in a million and I can't wait for our 2* debut! The journey home went very smoothly with a stop at Belin Beliet with our new friends and long drive back to Calais. Horses, humans and dogs were all very grateful to be home, tired and happy! We had some amazing non horsey times out there too including eating in some fantastic local restaurants using google translate to help order!! Met some lovely new friends and I can't wait for Barocca 2016!!! Wishing you all a happy and successful season! Kick on!